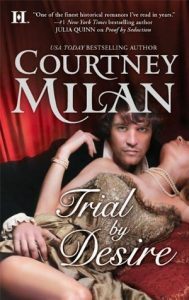 I won a copy of Courtney Milan‘s Trial by Desire through Goodreads. In the three years since her husband left her, Lady Kate Carhart has managed to forge a fulfilling life for herself. But when Ned Carhart unexpectedly returns, she finds her tranquility uprooted — and her deepest secrets threatened. Though she has no intention of falling for Ned’s charms, Kate can no longer deny the desire that still burns in her heart. OK, I won’t say this is a bad book. I know Milan is quite popular. I’ve even read and enjoyed some of her books. But the simple fact of the matter is that I DID NOT LIKE THIS BOOK. That’s the truth of it. I found Ned horribly selfish, from start to finish. Yes, I understood that he was young and fighting demons, that he regretted having left and was trying to make amends. My problem was that he returned just as selfish as he left. I didn’t find his fear a good enough excuse for the fact that he allowed his own wants to overshadow Kate’s openly expressed desires, over and over again, hurting her repeatedly. Further, I didn’t understand why she continued to trust and love him. And that after the simple fact that after a 3 year absence (in a three month marriage), I wouldn’t have been inclined to forgive him in the first place, let alone over and over again. Then, there was the domestic violence aspect. Milan spouts all the right words about it not being a woman’s fault, etc. But then she sculpted a heroine who laughed in the face of an abusive man. Yes, he was going to hurt her regardless, so why give him her fear. But it totally glossed over the fact that he very well could have killed her and purposefully antagonizing him isn’t admirable. Placation isn’t weakness if it keeps you alive. And of course the abused woman eventually stands tall and confronts her abuser. While I understand how this was supposed to be a triumph, if you really look at the inverse of it, regardless of what Milan espoused in the narrative, it all suggests that women who don’t laugh in the face of their abuser or stand tall because they’re so strong must in fact be weak. I was offended by the whole storyline. This entry was posted in books/book review and tagged book review, historical, romance on April 8, 2018 by Sadie.